West Papua National Parliament or Parlemen Nasional West Papua (PNWP) addressing the demonstration Of Militia created by the Government of Indonesia call Barisan Merah Putih. In connection with the demonstrations anti West Papua National Committee in Indonesia Language Call Komite Nasional West Papua (KNPB) and United Liberation Movement for West Papua it called ULMWP held in the House of Papua Province. West Papua National Parliament as a Representative Council Body which created by People of West Papua and facilitated by KNPB, so on this occasion said that: Barisan Merah Putih is one of the organizations that created and facilitated by the Indonesian State Intelligence to offer resistance to the Movement Self Determination rights of West Papua people. 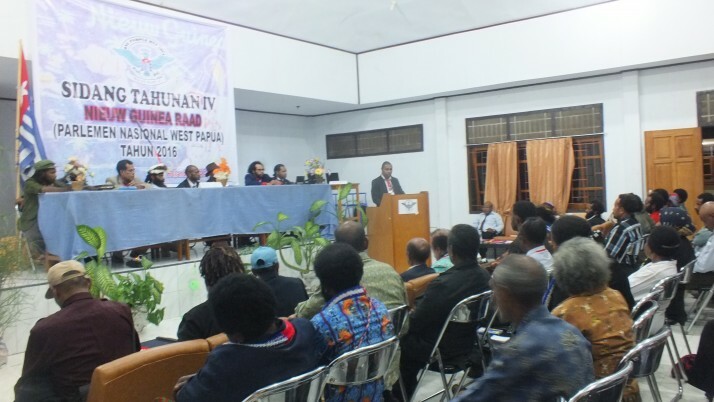 This organization has been set up in several cities in West Papua. The Indonesian government is already very experienced in the issue of setting Merah Putih militia (Indonesia). Indonesian government’s experience in the formation of Militia such as in East Timor, which Indonesia militia formed to fight against the East Timor people resistance movement for independence , in Aceh, where created insurgents against GAM movement. The UN has already criticize the Indonesian government’s actions -Action as special officers report on the implementation of Act of Free Choice 1969 by Reported UN, Mr Ortizan, INTERFET report on East Timor. the West Papua National Parliament declared that action to deny Barisan Merah Putih to KNPB and ULMWP is a movement sponsored by the Indonesian State Intelligence to commit acts counter to the political interests of Jakarta in West Papua, National Indonesian and International. For that PNWP appealed to West Papua people remain on the agenda for call needs to exercise self-determination rights of West Papua people, as this right has not been done fairly and with dignity based on the principles of international law, standards of human rights and the UN Charter. Emergency situations and have been created by the enemies of the West Papua lately become a moment of unity of all and the whole organization of the resistance movement in West Papua. Action may 31, 2016 is a moment of unity of all West Papua people pro Independent from the Indonesian occupiers. Hopefully this call can be heard by all the leaders of the resistance organizations in West Papua. And consolidated itself to go down the road, paralyzing the entire urban centres throughout the country West Papua. Best regards Buchtar Tabuni, Chairman PNWP and Decelerator ULMWP.